Flora and Fauna / What's in a Name? The Latin term flora is derived from the Roman goddess of plants, flowers, and fertility with the same name. The name fauna is derived from Roman goddess of earth and fertility Faunus and from forest spirits called Fauns. These terms are used in biology to denote plant and animal life of any particular region or time. 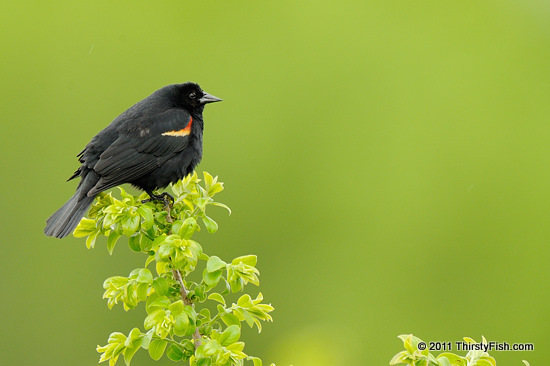 The fauna of this frame is the older male Red-winged Blackbird. ...and the big green creature behind it! Have you ever thought about the reason we choose the names that we choose to designate things. Does the name of something really matter? For example, deities of past cultures are commonly used to name things; The planets, Mercury, Venus, Mars, Jupiter, Saturn, Uranus, Neptune and Pluto are all named after Greek or Roman Gods. Not sure about Pluto. That might have been named after the Walt Disney character Pluto the Pup?